Early on in the PlayStation 4 gestational process it was made known that Sony’s aim was to design the console in close parity with a PC architecture. As a result, several prominent PC free-to-play franchises have made the jump over to the PlayStation platform. One such title is the recently released mech-infused first person shooter, Hawken. Can a game that planted its roots back in 2012 still flourish in the current console gaming landscape, or will it prove that sometimes even the most mature of games sometimes cannot survive the transition? On the surface, the elevator pitch for Hawken’s PlayStation 4 re-release is great. “Remember the amazing part of Titanfall, where you would get to control a gigantic mechanical god, and wreak havoc on a battlefield full of cannon fodder? Now just imagine you could control a monstrosity of engineering all of the time!” Despite the fact that the game was initially released over a year and a half before Respawn’s freshman outing, Hawken proved to be way ahead of its time. Unfortunately, it doesn’t appear that the game has evolved enough in the last four years to keep up with the rest of the Joneses in the online multiplayer space. As a player, the first time you take the helm of an overpowered mechamonster, it is an amazing feeling. The sheer euphoric power at your fingertips is borderline intoxicating. The problem is, if the battlefield is chock full of mobile weapons of mass destruction, it is hard to maintain the same awestruck glee beyond an initial first impression. This is so much the case, that it’s almost better to think of Hawken as a straight up online first-person shooter, and just forget about that whole Transformer from hell, thing. Sure, players are then reduced to being nothing more than a turret with legs, but let’s be honest: isn’t that pretty much true of any modern shooter? The combat mechanics actually play out competently. In some respects, the whole mech angle actually breathes a bit of fresh air into the gameplay. Instead of being insta-downed by a twitchy ten-year old, the more measured and deliberate navigation helps slow down the speed and pacing of firefights. The result is a far more strategically minded conflict that doesn’t focus as much on sheer firepower as much as knowing the weaknesses of the opposition, and exploiting them to your full advantage. The previously mentioned strategic angle to combat is where the game’s branching mech unlocking tree comes into play. As players earn in-game currency throughout matches, they can then choose to use the funny money to either upgrade the specs on one of the units already in the garage or purchase a completely new vehicle. Obviously the enhancements cost less than an entirely new mech, which is where internal arguments will most frequently occur. The key decision is choosing between what can be used in the short term to be temporarily competitive, versus what would be the most beneficial in the long run. Much like in any other class-based shooter where teamwork is a key factor in a squad’s success, each death-dealer has its own specific strengths and weakness. To be completely blunt, early on, the base unit will be a tough slog to be proficient with in battle. Thankfully it doesn’t take long to reach the first payday. This first cash infusion opens up the opportunity to purchase a customized unit. Choose carefully, because after the first gimmie, the process of earning coinage becomes a far more time consuming, uphill climb. One area where the game does a rather poor job of communicating to players is in each unit’s description. 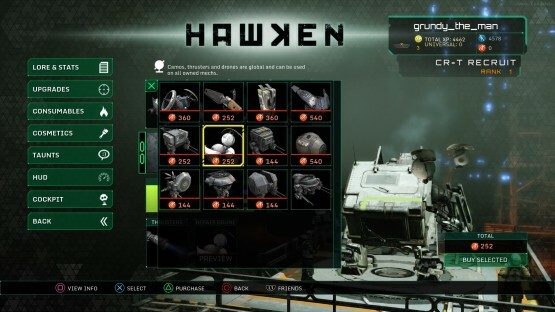 Despite the fact that each primary weapon is user selectable on the schematic screen, there is no sort of an indication as to what the weapon actually is, within the Hawken universe. These weapon names might be significant to someone steeped in the game’s lore, but to the untrained n00bs like myself, it’s damn near impossible to distinguish if something is a machine gun, missile launcher, or cannon powered only by buyer’s remorse. There’s a slight blurb as to the capabilities and specializations of the mech in its overview, but it would be nice to determine what a primary weapon actually is at a glance. Also, this would make researching prior to a purchase, far more straightforward. Part of the reason why it is important to diversify your garage is the varied map designs. Some layouts tend to be broad and spanning, while others are tightly compacted and instead stacked vertically. As diverse as these maps are, however, they all suffer from a chronic case of Unreal Engine 3 syndrome. What do I mean by this? Be fully prepared to be dropped down into environments that feature a palette of drab blacks, gray, browns and reds. There are occasional exceptions to the rule, but more often than not, the overall aesthetic has almost a grimy sheen that defined the last console generation. Though the environments seem rather bland, the bigger off-putting factor at play is the mech’s camera. As you might expect, depending upon the design of the unit and the speed it is moving at, there can be a slight wobble to the player’s perspective. This tilt in and of itself isn’t necessarily a bad thing. However, once the potential lag of online multiplayer is introduced into the formula, suddenly the framerate has a tendency to dip from time to time. Those dropped frames are enough to transform an organic perspective shift into a nauseating slideshow. While this wasn’t something that occurred in every match or even something that will be instantly apparent to the player, it was happening frequently enough that I had to limit my play sessions to an hour at a time. 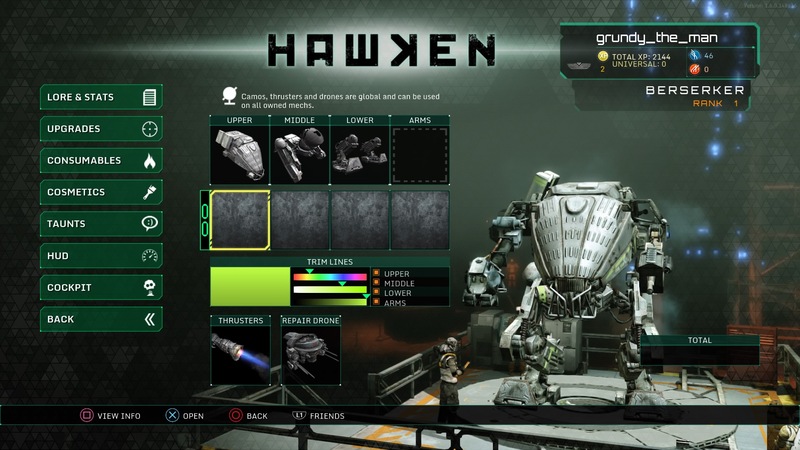 It is notable that Hawken is a completely free-to-play experience. At least in my time with the game, there were no instances of paywalls or premium content that broke the game’s balance. In-game currency purchased using real money was a completely different variety of currency that could be used to purchase emotes, upgrades, or projectable logo images, as well as other mechs. Aside from emotes and logo images, everything else can be purchased via the standard coinage accrued through completing matches. This means that the only items that are pay walled are purely cosmetic enhancements. Foresight like this helps maintain the balance between those that want to spend cash and those that would rather invest time, while also assuring it’s a level playing field for everyone involved. If you are looking for the next groundbreaking first-person shooter on PlayStation 4, Hawken is probably not going to live up to your expectations. The game does deliver an initial burst of exhilaration, but this is unfortunately unsustainable beyond a few outings. When the dust settles, what remains is a run-of-the-mill class based shooter, set in a series of drab environments. This is a genuine case of getting what you pay for. 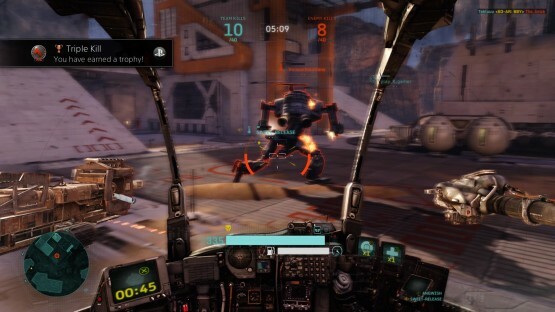 Hawken is available to download for free on the PlayStation Network. Reviewed on PlayStation 4. For more information on scoring, please read our Review Policy here.